Being a creative professional sometimes means venturing forth without a map. It means deciding that you’re going to dedicate your time and energy, delve deep into an artform or creative medium and commit yourself to it wholeheartedly. Chingas Kemps has made such a decision. He’s been obsessed with music and audio as far back as he can remember, tinkering away in his home studio, making music and recording it any chance he got. As Chingas’ involvement escalated from the casual to more professional he debated going to school to perfect his technique. But that would not prove easy. The further he got into the recording world, the harder it was for him to find the time to attend a school that would undoubtedly take him through all the basics, stuff he already knew like the back of his hand, before he’d be able to get into the stuff he really wanted to learn. And what about all the opportunity cost of it all, the potential recording jobs he’d have to forego, money he’s miss out on making because he was stuck in class? 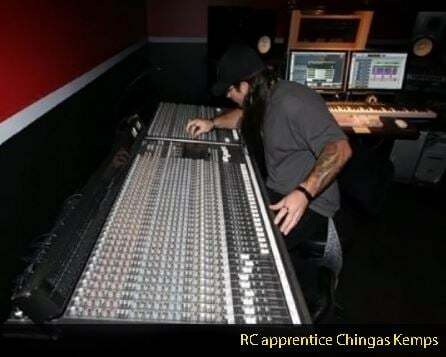 Chingas’ professional ambitions were always to be a successful audio engineer and producer. Thanks to the connections and technical guidance he’s getting with Recording Connection, that ambition is quickly evolving into a solid career. Chingas is one of many individuals who entered our program because they see the benefit of guided, hands-on instruction that’s suited to meet their exact needs. And while they learn, they’re also showcasing their talents and getting to know everyone in the studio. Chingas made a conscious decision to fully commit to a life in the music business and it’s paying off. Big time.